Clear fruity color and luster on the lips. ･Pure color and fresh gloss and moisturizing beauty oil in one, Liquid Rouge. The arrival of Sheer Type Oil Rouge Long lasting full, juicy lips with fruitiness. ･Smooth application with a "Light Touch Juicy Oil" formulation. Juicy luster and clear translucent color created by a thin light texture film. Increase the glamour with even more brilliance thanks to the highly refractive blend of oils. ･The gel creates a perfect fit of "Light Touch Juicy Oil" holding power on your lips. Perfect hold maintains your juicy color packing in moisture for fresh lips. ･The design has a round cherry shape with a cut glass bottom like buried treasure inspired by the concept of "rouge that makes lips bear fruit". A Light Rose Swarovski sparkles at the center of the blossoming fruit with J embossed plaque crowning the top. ･Apply a suitable amount directly on the lips using the applicator chip supplied. 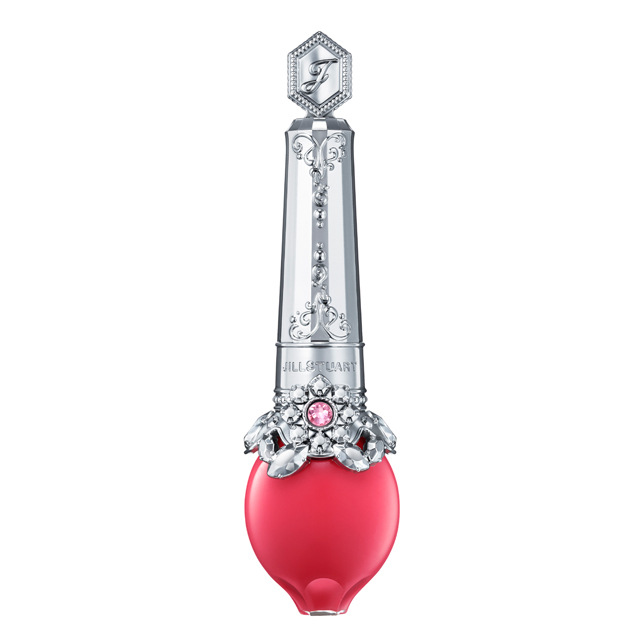 The glittering cap is a perfect match for the cute rouge personality.